Before I came to study at City, I completed my International Baccalaureate Diploma at an international school in Japan, where I lived for four years. Before that, I spent five years living in the south of India, where I also attended an international school. 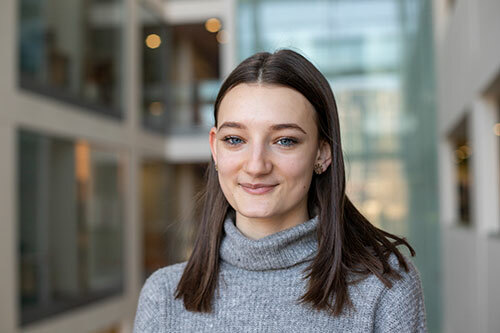 I decided to apply to study at City because I had heard great things about Cass Business School, and I was aspired to do a business-related undergraduate degree. When researching the university, the diverse pool of students appealed to me, considering I spent most of my life in a very global environment. The students and the faculty members come from all over the world and have similar backgrounds to me, having spent a big part of their lives living abroad. I also appreciate that the academics who teach at Cass Business School also have an impressive set of qualifications and extensive experience within the business field. I am part of the City’s Field Hockey team. Joining a sports team or a society is a great way to meet people that have similar interests and students from different years and courses. I plan to continue my studies with a postgraduate degree related to business management, or start working right away, hopefully in a field of interest. Find out whether the course is something you are genuinely interested in. Ensure you want to study this subject, as this will make the workload easier to handle, and you are more likely to succeed in this course.